April | 2018 | Gamer Splash! Over the years, as technology has progressed, physical media for software has become less and less prevalent. Gone are the days where we need to insert a DVD into our PC’s DVD drive to install software. CDs and Blurays are declining in popularity, due to the popularity of digital downloads and streaming. Even PC gaming has already gone mostly digital, with services like Steam dominating physical copies. Smartphone apps have always been 100% digital. Yet, for many console gamers, physical discs or cartridges for their games still reign superior. 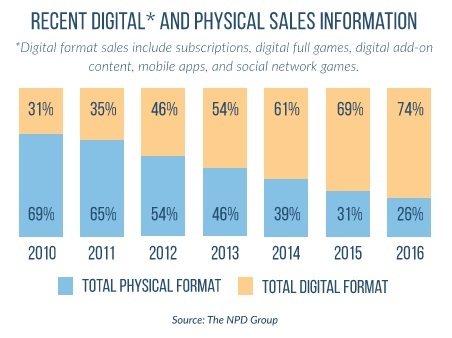 As you can see from the above infographic, most gamers have made the switch to digital now, but there are still many holdouts for physical games. Let’s delve into why many still prefer physical games, their reasoning, and why I believe digital is still superior. You get to “own” your games. You won’t lose them if the servers go down in 20 years. Resellability. You get to resell your games once you’re done playing them, thus softening the blow from new game puchases. The physical cover art is nice. It may fit well into a bookshelf and you like to show off your games. Now let’s try to address each of these concerns. To address the first point, there is no debate: owning your games is sure nice. The reasoning goes, when you download a game digitally, if the developer/publisher decides to pull the game from the digital storefront, then the game is lost forever. Thus, you don’t truly “own” your games, like you do when you have a physical copy. However, there are some problems with this philosophy. First of all, you don’t own the game any more than with a digital copy. No individuals who buy a copy of a game own the game: they simply purchase a copy of the software and a license to play it. While it is concerning that a game could be pulled down in 10 or 20 years, what are the chances you will actually care about playing that game again that many years later? Games come out all the time, and I personally am not going to want to go back to a 20-year-old game, when I’ve already played it, and there are so many other great games to play. Also, with games increasingly traveling to new systems through backward compatibility and games no longer being so tightly locked to system generations, it’s likely that games will be available for years after launch. Gamers don’t havbe a problem with how Steam, the all-digital PC game platform, works, so why have a double standard with console games? Also, physical games aren’t impervious either. After 20 years, a physical game is likely to begin deteriorating, whereas a digital game would not. And if you truly desire a physical copy in case a game goes down, you can actually make multiple “physical” copies of every game you have by just loading them all onto multiple hard drives or SD cards! If you were to buy two copies of a physical game, you would be spending double the money. Going digital and copying the game files to another SD card or hard drive, you can now own more copies for less money. Resellability is also nice. I sold many of my Wii U physical games to save up for the Nintendo Switch, and that saved me some good money on it. However, the way I currently play games now, I don’t like getting rid of them. I’ve regretted selling games many times, because it was a good way to make extra money at the time, but I ended up wanting to play them again later, thus ending up rebuying them. That made me spend more money in the long run. Going digital now, I prefer to just have a library of games now, and just buy ones I know I’ll want to keep for a long time. Don’t get me wrong: mI like cover art too. One of my friends has a really nice physical media collection of games and movies that is really cool to look at in his book case. However, I don’t think it’s necessary. For me, the reason you buy a game is to enjoy it. If you were to count the amount of time playing a game versus looking at it on your shelf, it would probably be a 9:1 ratio. Additionally, I think the quality of the game is what’s important, right? Also, when you buy a lot of games, they add up, and they end up using a lot of space. I prefer to keep my room as minimal as possible now, and having all of my games digitally means I don’t have to worry about where to put game cases now. For me, since I spend most of my time playing the game, I’m happy to go without the burden of the physical copy. While it is true that physical games can be cheaper, as digital games become more popular, many more sales are starting to happen for digital games. Plus, you get all the benefits of going digital. While there are a few benefits to going physical, I believe there are more for going digital. You don’t need to rebuy a game if you lose it. With a digital copy of a game, the game is tied to your account, so if you ever delete a game, or even buy a new system, the game can be redownloaded an unlimited number of times without any cost. With physical copies, if you lose yours, you are out the money – twice. Digital gaming is much more convenient. If you have 50 Nintendo Switch games, you have to take every game you might want to play on a trip. Yes, you can plan this out, but then you have to plan it out. Having every game digitally means you can have them all on one SD card, and never need to think again about which games to take. You won’t lose digital games on the go, either. You can get to your games faster. Imagine if on your smartphone, every time you wanted to switch between an app, you would have to take out an SD card and put a new one in. That would be horrible, wouldn’t it? But that’s how physical consle games still are today. If you go digital, you don’t have to worry about swapping discs or cartyrirdges every time you want to switch to a different game. It’s all there at once, waiting for you to tap it once and start playing. You can start playing faster. You don’t need to wait for a physical game tyo ship to you, or go to a store to buy one. You can buy the game directly from your console, and start downloading it instantly. You don’t even save on storage space. On Xbox and Playstation, you have to install your games anyway. On these systems, even if you buy a physical copy of a game, you must still install it tyo your hard drive, just like if you downloaded it. Spinning discs don’t actually have enough data throghput to run the latest games smoothly. The fact is, hard drives are the only way modern games can run now, so buying a physical copy doesn’t even save you storage space, and just adds the extra hassle of needing to insert the disc for each game. More rewards. With Nintendo’s systems, when you buy a game digitally, you get reward points that can be used towards discounts on new games. While you can obtain some points with physical versions, it is a fraction of the amount you get for the digital version. Going digital saves money in this regard too. It’s better for the environment. Companies have to print, ship, and use paper and ink to get a physical game to your doorstep. Buying a game digitally means you are going green, and is better for the environment. Buy a game digital, save a tree. In today’s current online age, I find it odd that the very same people who are satisfied with digital apps and services like Google Drive, MS Office, and Creative Cloud, still cling onto physical console games. I realize that phyiscal games have been around since the verey first home games consoles, and there is a sense of nostalgia tied to them and fear of moving beyond the physical. However, I hope this article has helped dispel the misconceptions about going digital, and provided help in your decision process going forward. While some will hold onto physical media until it goes extinct, I believe the future of gaming is digital, and for the better. It’s still debated, but personally, it’s a future that I’m okay with.